A quiet revolution is occurring in the hills of Northern New South Wales (NSW, Australia). Kerrie O’Neill of BambooBusy has been capturing CO2 by growing bamboo on her pastureland and turning it to biochar. 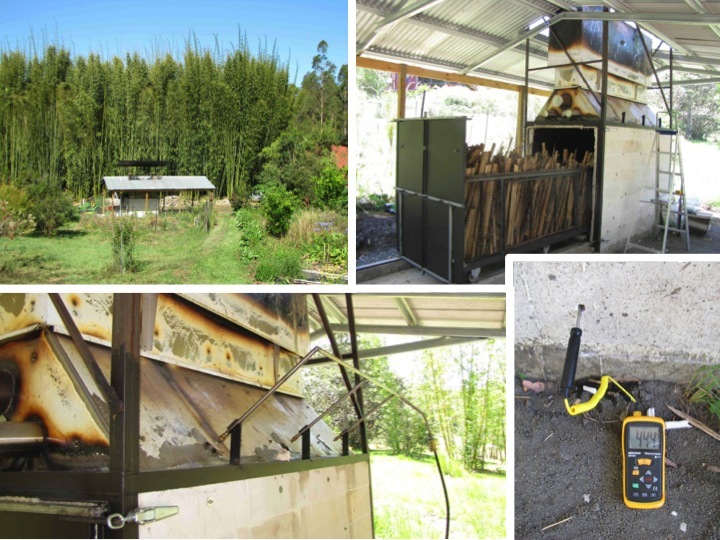 After attending biochar workshops run by Paul Taylor of Biochar Solutions Australia and Professor Stephen Joseph, O’Neill decided to invest in a low emissions biochar kiln that could convert bamboo, animal residues, and other biomass such as grasses into high quality, plant-effective biochar. She engaged Biochar Solutions Australia to develop a kiln in close collaboration with Professor Joseph. The ease with which the kiln can be loaded and unloaded via a cart on rails with the aim of being easily operated by a single user. O’Neill noted that she (as a 67 year old) is able to run the unit by herself. The ability to handle mixed feedstocks such as bamboo, bamboo leaves, grasses, and manures in order to make mineral enhanced composite biochars, aided by a partially oxic environment (the presence of flue gases and flame in the kiln). The ability to control the rate at which the biomass is heated to produce either a hard (slow heating) or soft biochar. The use of water mists during the conversion process to control the temperature, clean up the combustion, and activate the surfaces of the biochar. The use of secondary combustion air introduced above the cart to partially inhibit and dilute air ingress above the pyrolyzing biomass, and also to crack and pyrolyze gases—ensuring more complete combustion. The kiln is made of 100mm thick Hebel Block (a lightweight, aerated, thermally insulating concrete building block), lined with 25mm refractory wool sheathed with mild steel to keep the mist and the quenching water off the wool. The transition to the chimney and chimney itself are made from stainless steel sheets lined with 12mm refractory board over 25mm refractory wool. The steel mesh-sided cart rolls on high-temperature rated aluminum wheels on metal rails. The kiln door is attached to the cart and seals against a rope seal with compression latches. The firebox is constructed of standard clay bricks, some kiln shelf, and refractory mortar. Flue gases are distributed above and below the cart (controlled by a flap valve) through a 100mm stainless flue pipe with many 8mm holes. Secondary air is supplied below the entrance to the chimney via a similar 150mm tube. Soak or coat the bamboo in a mineral mixture consisting of clay, basalt dust, rock phosphate, and manure for at least one month. Sun dry the mixture until the moisture content is less than 20%. Make sure the bamboo is either split or has cracked due to soaking, or drill holes if one side of the material is not open. Load the bamboo vertically and place sufficient dry straw and/or leaves and chicken manure inside and around the bamboo to provide nutrients to the surface during pyrolysis. Stacking the bamboo vertically allows better gas and water vapor to flow up through the bamboo and more rapid heat transfer down through the bamboo once the top is ignited. 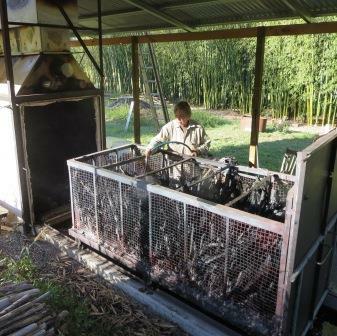 Chicken manure placed into the hollows of the bamboo and around the outside also helps keep the pyrolysis more controlled temperature-wise, which prevents runaway combustion in the partially oxic environment. After the cart is rolled into the kiln and the door sealed, the fire is stoked in the external firebox and combustion gases are channeled above the cart. Once the chimney is warm and the firebox is drawing well and cleanly burning, more flue gases are diverted underneath the cart to slowly heat the kiln to 150oC and dry the biomass. Water can be dribbled onto a hot plate at the back of the firebox to generate steam. To produce hard biochar (more suitable for resisting compaction) this drying, steaming, and conditioning process is carried on for 2 to 3 days. For soft biochar, which has a higher concentration of labile organic molecules that can assist in plant resistance to disease and be used by micro-organisms as a source of food, the kiln can be raised to 150oC in 2–3 hours and maintained there for 1–2 hours. Thermocouple probes (see Fig. 1) monitor the temperature at nine locations throughout and above the bed. For example, in one run, prior to igniting the cart, kiln thermocouple readings showed 180oC above the bamboo, 150oC in the middle of the bamboo, and 100oC at the bottom of the cart, with the lower temperatures continuing to rise over time. 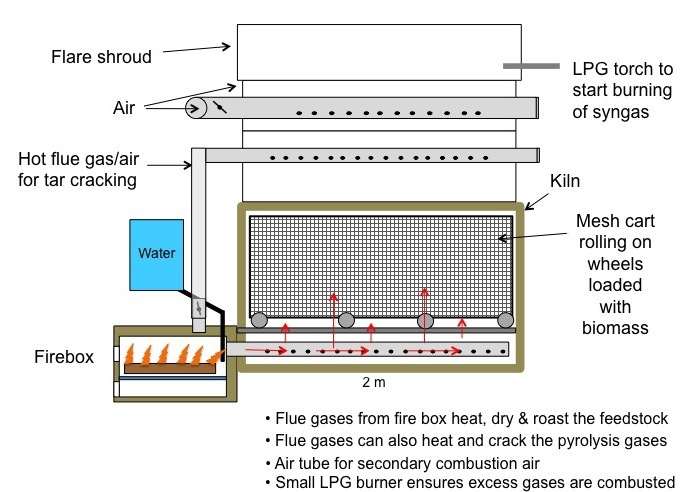 Applying a torch to the top leaf litter then ignites the top of the cart, and air from a blower is distributed into the kiln via the manifold below the chimney. After combustion on top of the bamboo and chicken manure is well established, the firebox air input vents are fully closed and the remaining combustion gases from the stove are diverted from underneath the kiln to above the kiln so pyrolysis proceeds in the cart with minimum oxygen. Pyrolysis gases rise above the cart and flare when they come into contact with the secondary air inlets. Radiant heat maintains the kiln at pyrolysis temperature. To ensure efficient combustion and uniform temperature on the biochar, a fine mist of water is injected via 3 spray nozzles for 5 – 15 seconds every minute or so. 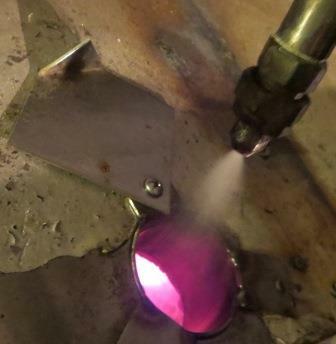 This increases the concentration of H2 resulting in a very clean plasma-like bluish flame. The frequency of operating the spray jets is adjusted to maintain the desired temperature in the bamboo/biochar bed (example 400oC). Once the temperature at the bottom of the cart has exceeded 300oC (pyrolysis has reached the cart bottom) and the pyrolysis gases have abated, the spray jets are kept on continuously to cool the biochar. When cooled to 100oC it is safe to remove the cart and fully quench the biochar with hose water. Nutrient rich water is captured in a trough below the cart to be used in the garden. 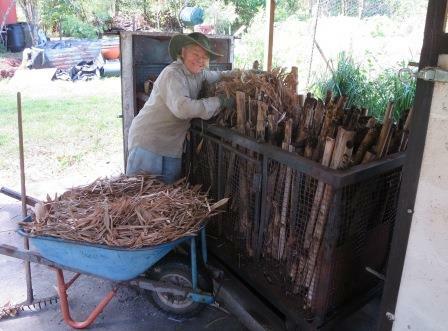 O’Neill will use her biochar for production of bamboo and to build up her soil carbon, break down her clay soils, and improve her yields in her vegetable garden. Over a period of years, she plans to turn her clay soils into dark terra preta-like soils. O’Neill is part of a growing community of smallholders who are making biochar both to improve soil fertility and capture carbon. Figure 1: Kiln scematic (all photos courtesy of the authors). The completed kiln on location at O’Neill’s farm. O’Neill placing bamboo leaves on top of the vertical bamboo feedstock in preparation for running the kiln once the bamboo-clay-manure mixture has dried. Water jets misting water into the kiln through an inspection port. 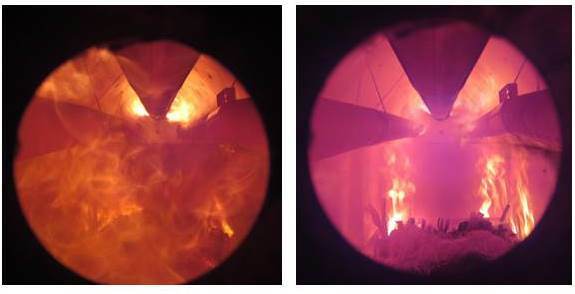 The image on the left shows the pyrolysis gases lazily burning in the generally reduced oxygen environment inside the kiln, as well as flaring hotter at the air inlet jets of the secondary air tube; the right is the same picture just after the water sprays have cooled the combustion, and generated steam and hydrogen on contact with the biochar. This has quenched and cooled some of the kiln-filling flame—leaves and bamboo in the cart can be more clearly seen, and hydrogen is burning with a bluish flame. When cooled to 100oC it is safe to remove the cart and fully quench the biochar with hose water. An electron micrograph picture (left) shows the increase in mineral matter on the surface of the bamboo biochar. These minerals are available for use by future plants.